"Heartwarming story of forgiveness and love." 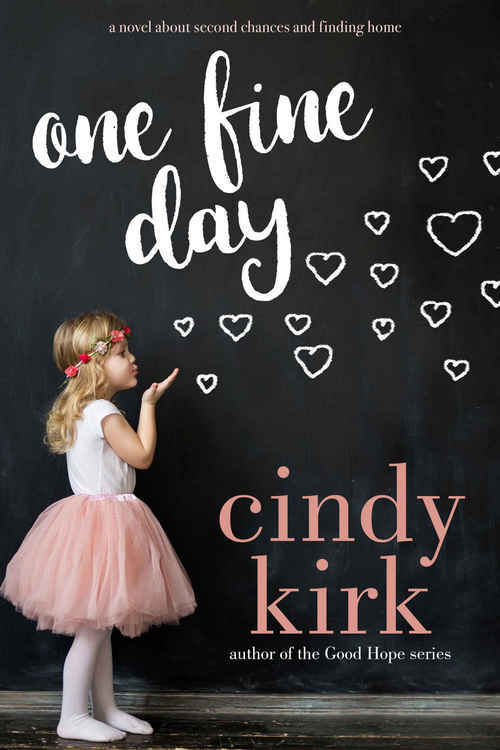 ONE FINE DAY's prologue draws the reader into the story immediately. Abby Fine agreed to be a surrogate for her childhood friend Jonah Rollins and his wife Veronica. Complications with the pregnancy are discovered; the Rollins' decide to walk away from their special needs child. Abby is determined to continue with the pregnancy. This decision impacts every aspect of Abby's life�she is cut off financially and emotionally from the entire Rollins family�she is on her own. Five years later, Abby is running the Inn at Hazel Green which she inherited from distant relative. She and her daughter Eva Grace are part of the tight-knit Hazel Green community. Eva Grace captured my heart. Her personality and her enthusiasm for life jumps off the pages! Abby's devotion and patience with her daughter shines through in each page of this novel. Cindy Kirk's descriptive writing style enables the reader to connect to Abby. I could hear the joy in Abby's voice when she talked about her child and feel the hurt when she reminisced about Eva Grace's surgeries. My heart broke when Abby's thoughts brought her back to the day that Eva Grace was born. Frightened and alone, she reached out to Jonah. I felt her pain and severe disappointment -- Jonah never responded to her phone call or her text. Jonah's monthly letters to Eva Grace and Abby and the support money he sent in the letters provided a connection between Abby and Jonah. The fact that Abby didn't read the letters but saved them intrigued me -- why did she keep them? Abby's ability to put her child's best interests first and to forgive are tested when Jonah becomes the new police officer of Hazel Green. She is tested when Jonah makes it clear that he has moved to Hazel Green to get to know his child and repair his relationship with Abby. Jonah mentions that he wrote to Abby that he had accepted the position in Hazel Green and that he was divorced. He is amazed when Abby tells him that she has not opened his letters. Cindy Kirk uses the backstory technique to provide insight into both Abby and Jonah's history. Jonah's backstory is woven into the present day story and it allowed the reader to gain perspective on his choices, his situation. I loved the scenes when Jonah explains to Abby what factors led him to side with his wife. This revelation is important as it gave insight into Jonah's situation and his decision making. The author subtly introduces the idea that not all choices are black and white and that life experiences impact the choices you make. My favorite scene in the book is when Abby decides to read each one of Jonah's letters -- this decision opens her heart towards forgiveness. ONE FINE DAY has all the feels. It's an emotional story which tugs at your heart from the first page. The characters are honest and the dialogue is superb. Eva Grace will capture your heart. The themes of loss, forgiveness, and love are told with compassion and humor. Although I am not quite ready to leave Cindy Kirk's Good Hope series....this book holds a special place on my keeper shelf! Abigail Fine learned early in life it�s hard to get ahead when you start with nothing. She hoped serving as a surrogate would allow her to not only help a friend, but jump-start living her own dreams. Jonah Rollins always considered himself a loyal friend and an honorable man. Until he made a decision that destroyed a long-standing friendship and eventually, his marriage. When life threw her a curveball, Abby did the only thing she knew how: the right thing. Her life might look a whole lot different than she imagined, but she wouldn�t have it any other way. Now, five years later, the past has come calling. Life�s presented Abby with an even bigger challenge: one that will test her capacity to forgive . . . or force her to close her heart forever. But Abby and Jonah just might discover that there are no bounds to how wide her heart can open or how deep his love can run.